We at Blues Leaf are saddened by the passing of our longtime recording artist, Gene Ludwig. We've had the pleasure of recording 5 cds with Gene. Besides being a great organist, he was a truly fine and gentle human being. He will be sorely missed but his music will always live on. Joe Morabia and the Blues Leaf Family... July 15, 2010 Gene Ludwig Obituary: http://post-gazette.com/pg/10197/1073085-122.stm Tradition, the handing down of customs, beliefs and stories from generation to generation, runs especially strong among jazz organists. They are a select crew, after all, piloting jazz’ Spruce Goose, the technically marvelous Hammond B-3 organ, through the turbulence of time and popular taste. It’s no easy feat, of course, coordinating hands and feet, keys and pedals with mind and spirit. It’s no secret either that, when done right, the Hammond beast soars like nothing else. Its twists and turns, jives and grooves, speak, communicate and resonate with you. Yes, Jimmy, times are rough, man. Yes, Ms. Scott, let my soul ache a while, won’t you. Yeah, Brother McDuff, I’m a little blue, today. Yes, Big John, you know what I’m talkin’ about. Yeah, Gene, take me with you. Yes, yes, yes! Academics call this “soul-jazz.” Fans call it good music. Gene Ludwig calls it a career, a life’s work. With the stout support of guitarist Joe Lano, drummer Tommy Check and special guest, Emedin Rivera on percussion, the music comes clean and straight, mad with swing, pure in logic. Explaining it with words gets academic and dry. We’ll let Gene explain it, let him take us on the ride. It’s good music. Yes. 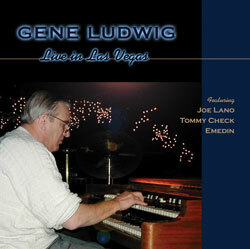 Gene Ludwig has been called the country's most passionate exponents of Jazz Organ. JAZZIZ hailed him as the "finest mainstream jazz organ player alive." "Hands On" the follow up to his critically acclaimed “The Groove ORGANization" teams Gene up with some of Pittsburgh's finest jazz musicians: Gene Ludwig (Hammond B-3 organ), Eric DeFade (tenor saxophone), Ken Karsh (guitar), and Tom Wendt on drums. This cd confirms the fact that Gene Ludwig keeps his "Hands On" his organ! Recorded at Stargate Studios, Pittsburgh, Pennsylvania.